Google AdWords pay-per-click (PPC) advertising is one of the best ways to accomplish this, however it can be an intimidating process for beginners. After spending many hours showing other fellow Realtors how to set up an effective AdWords campaign, I thought it would be beneficial to make a step-by-step article for future reference and visual guidance through the process. I have been using Google AdWords since 2009 and I've learned a lot about it since I first started. I'm happy to share my knowledge and experience with you to help you learn how to utilize this valuable resource. 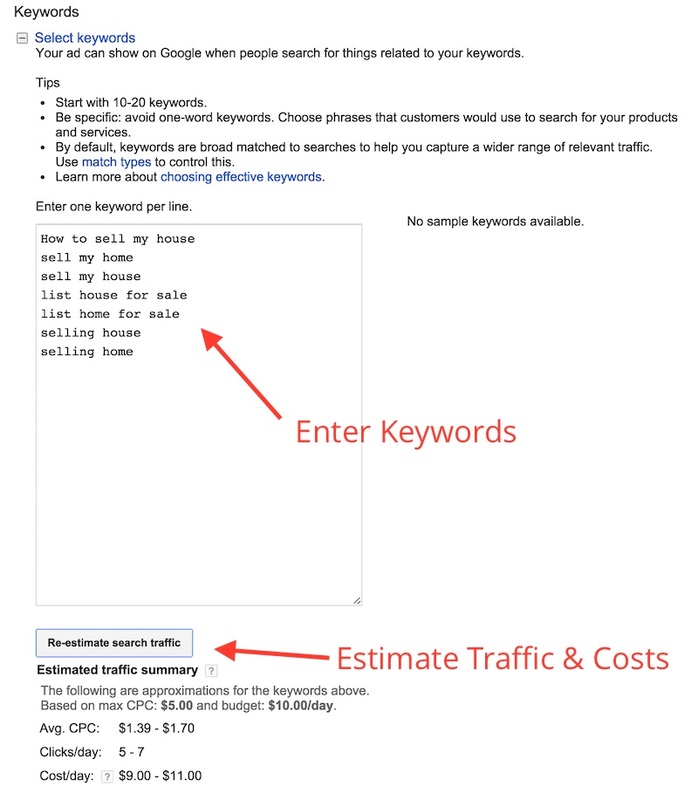 It's easy to blow $500 on Google AdWords with no results if you do not know what you're doing. When I first started using AdWords, I almost gave up on it because it seemed to eat through my budget within days, with no benefits to show for it. It is precisely this reason that there are services that will set up your campaigns for you. In my opinion, you stand the best chance of success by setting up your own campaigns and learning the service yourself. You'll spend less money and learn valuable skills this way. If you follow the steps below, you can have an effective AdWords campaign setup and running within minutes. I have made the 15 steps below as simple as possible by creating screenshots for each step. Just follow each step to complete an effective Google AdWords campaign that will drive business to your website based on your needs. 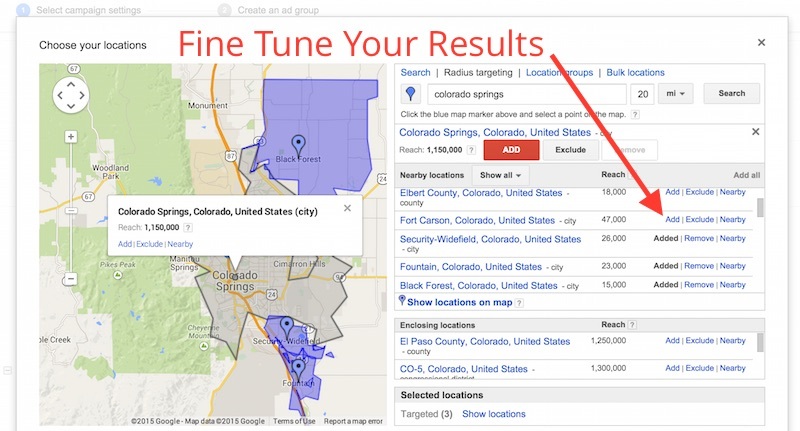 Running ads on the Search Network is the most common way of setting up your champaign. This choice allows your ads to appear on Google SERPs alone. Selecting "with Display Network" extends your reach to smaller search engines like AOL, and thousands of other sites. We want to target consumers who are actively looking for our products on Google, so we are choosing "Search Network Only"
This will allow you to choose certain times of each day for your ads to be shown. I'll explain later how this option will help keep your account stats higher (CTR) by not gaining ad impressions during less performing hours. You may be setting up many more campaign, so make sure to properly keep your titles relevant to keep track of your campaigns. Google automatically checks this for you, so make sure that it is not checked. This will keep your ad impressions only showing within Google's paid search results. I will target my area, plus a 10 mile radius to make sure that consumers in my extended area can find my ad. You can also target zip codes, radius of location, and many different other options. Play around with this section for a while to get the best results. On your "Bid Strategy", choose "Focus on Clicks" and then choose "I'll manually set my bids for clicks." The other options here are good to learn about and use later on to optimize your campaigns. For now, stick with the most common way to set up your ads to get started with an easy Pay Per Click campaign. 9.Set Your Default Bid for Clicks & Daily Budget for Your Ads. The amount you enter here is not necessarily the cost that you will pay for clicks. It is the maximum amount that you are willing to bid. I usually enter $5.00 here and end up paying around $0.40 to $2.50 per click on my ads, depending on my keyword's popularity. If you aren't willing to pay much for a click, Google may not take your campaign seriously enough to show it in the paid SERP's. 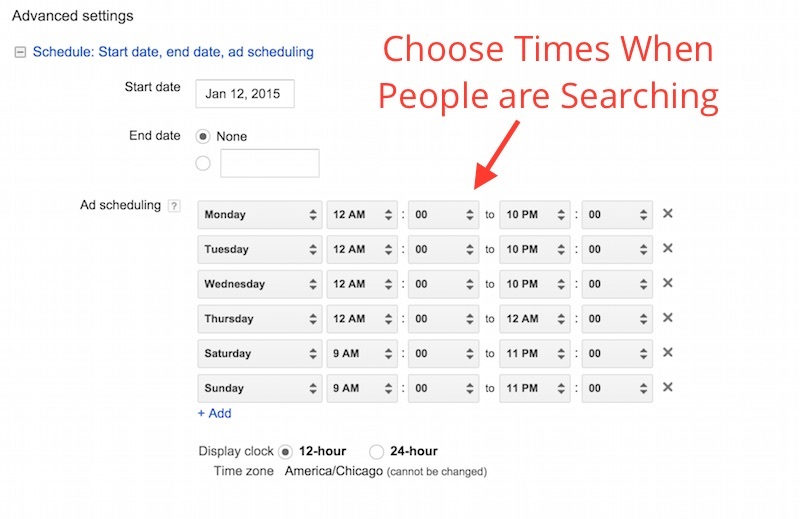 10.Set up your ad schedule based on when most people are searching for you keywords. This is one of the most important parts to help keep your click through rate low. I have my ads running everyday, except Friday. I run my weekend ads from 9:00 am to 10:00 pm and my weekday ads from 4:00 pm to 10:00 pm. This is the optimal time for my area, based on my past AdWords data. One of the major benefits of managing your own AdWords account is that it will reveal consumer search habits and trends to you. 12.Name your "Ad Group" with a relevant title. 13.Choose "Text Ad" and start creating your ad. This is where you will need to focus your efforts over time to get your keywords and ad text optimized to it's highest and best potential. Your Headline is the large print at the top. Try to use your most important keywords here. You have two lines for the description to help sell your ad to the consumer. Try to find sentences that have your main keywords in them, while still promoting your advertisement well. Don't go too keyword heavy. The "Display URL" is the URL that you want shown under your Headline. I usually use my domain name here. The "Destination URL" is the URL for the webpage that you want the consumer to land on once they click on your ad. 15.Click on "Save Ad Group"
You have just setup a Google AdWords Champaign and Ad Group. Nice job! (you had a good teacher) Now you just need to keep working on it. Here's a good resource to help you succeed your first time around. I recently wrote an article for RISMedia's HouseCall where I give out all of my best Google AdWords advice. This should help you understand the big ticket items that you need to focus on to really grow your business with AdWords this year.